Greatest On Screen LOVERS EVER!!! So, what can you expect from our Club?? Do you want to Join?? Then simply reply to this post!! And fill out the following SURVEY!! 1- Why do you love the Kajol + SRK jodi? 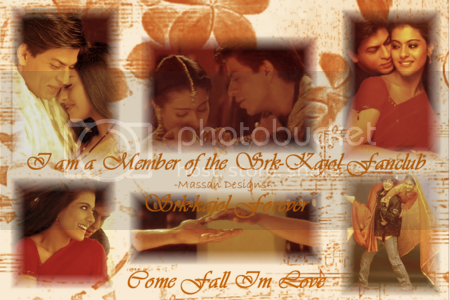 2- What is your favorite SRK + Kajol movie? 4- What is your favorite song starring them? 6- Please introduce yourself- name, age, etc. you will be added to our list of Members! Here are the Members IN CHARGE of the CLUB!! And here are our OFFICIAL SIGS! So please add something to your Signature! MUMBAI: Global Indian Film Awards (GIFA 2006) is scheduled to be held from 7 - 9 December, 2006 in Kuala Lampur, Malaysia. The event will kick start with the world premiere of B R Films and Ravi Chopra's Baabul at TGV cinemas in Kuala Lampur. The world premiere will be attended by the entire star cast of Baabul comprising Amitabh Bachchan, Hema Malini, Salman Khan, Rani Mukherjee and John Abraham. A celebrity football match and a fashion show auction and charity are scheduled to be held on 8 December. The award function, which is scheduled on 9 December, will have performances by Shah Rukh Khan, Salman Khan, Abhishek Bachchan, Priyanka Chopra, Katrina Kaif and Amisha Patel. The nominations for best film for GIFA 2005 include Kabhi Alvida Na Kehna, Krrish, Lage Raho Munnabhai, Omkara and Rang De Basanti. Aamir Khan (RDB), Ajay Devgan (Omkara), Hrithik Roshan (Krrish), Sanjay Dutt (Lage Raho Munnabhai) and Shah Rukh Khan (KANK) will be competing in the best actor category. The nominees for best actress include Bipasha Basu (Corporate), Kajol (Fanaa), Kangana Ranaut (Gangster), Kareena Kapoor (Omkara) and Rani Mukherjee (KANK). Those competing in the best director category include Kunal Kohli (Fanaa), Raj Kumar Hirani (Lage Raho Munnabhai), Rakesh Roshan (Krrish), Rakeysh Omprakash Mehra (RDB) and Vishal Bhardwaj (Omkara). 'Koffee with Karan' is preparing to return on Star Plus, with B-town's biggest and best in November (Johar starts shooting for season two in October). There will be a different set for the new season. Johar has just returned from London. Will he call new guests or all his friends again? We at least know that all the friends will be back, but in different combinations. Shah Rukh and Karan Johar to team up again? Shah Rukh Khan's casting in friend Karan Johar's film is a regular phenomenon. Even Johar's last film 'Kabhi Alvida Na Kehna' had Shah Rukh Khan playing a key role. Now a rumour doing round, Karan Johar will team up again with Shah Rukh for his next. Karan Johar has already started scripting for the film. "I've already started scripting my next," Karan confirmed in a recent interview. Also he assured that the film will go on the floor in early next year. On asked whether Shah Rukh Khan has been signed up for the film, Karan said, "Yes, I want Shah Rukh in the film. However other starcast is yet to finalize."